The Nerf Laser Ops Pro home laser tag set is the latest attempt to breathe life into the concept of smartphone laser tag. While I personally have my reservations around laser tag with smartphones, Nerf’s Laser Ops Pro is a surprisingly awesome home laser tag set. 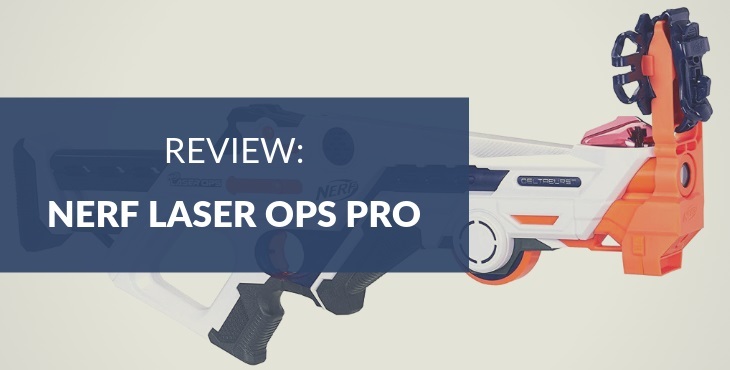 In this review I am diving deeper into the features of Laser Ops Pro and I will reveal how it stacks up against other popular home laser tag sets. Famous for their foam shooting blasters, Nerf released the Laser Ops Pro home laser tag set halfway 2018. It is the successor to the Nerf laser tag series known as Lazer Tag. The Phoenix LTX Tagger from 2008 is the most popular laser tag blaster in the Lazer Tag series. This model is actually still available for purchase on Amazon, despite the fact that it’s quite an aging model. That goes to show that the Phoenix LTX was, and still is, one of the best home laser tag blasters ever made. Boom, big call, but that’s what I honestly believe. Laser tag and smartphones are a difficult combination. Smartphones evolve continuously, and that new iPhone you bought yesterday will be outdated tomorrow. Not to mention all the different brands and models. Smartphone laser tag guns and their apps will need to continuously evolve with that smartphone market otherwise they will end up being outdated and incompatible. Playing laser tag with smartphones can also be dangerous, especially when augmented reality plays a big role. Imagine running around on the streets or in the park while continually looking at your phone screen. It’s an accident waiting to happen. The other reason why I personally don’t really like smartphone/augmented reality laser tag is that I’m just a bit old school. The fun of laser tag is aiming at and shooting each other without all the unnecessary tech. You grab a laser tag gun and start scoring points by tagging your enemy. Simple and fun. Time to have a closer look at Nerf Laser Ops Pro. At the time of writing, the Laser Ops Pro series consists of two blasters. The AlphaPoint is a smaller pistol-style blaster, and the DeltaBurst is a sniper rifle type blaster. They are purchased individually but obviously they can work together in a home laser tag battle. It’s no surprise that there are a lot of similarities between the two blasters which I’ll be covering below. With both blasters you can use a smartphone (iOS or Android) + app to enhance your laser tag battle experience. Let’s get one important thing out of the way. You don’t actually need a smartphone to play with these blasters. Using a smartphone + app is 100% optional. This is awesome and also a smart business move in my opinion. So in other words, you can play a full-on home laser tag battle with Laser Ops Pro without using any mobile phones. That makes old-school people like me very happy! If you do want to try out Laser Ops Pro using your smartphone, you’ll first have to download the app. It’s available for free on the App Store and on Google Play. You can either attach your smartphone to your arm or wrist via the armband, or attach it to the front of the blaster with the phone mount. The app allows for single-player and multi-player battles. In multi-player mode, you can differentiate between single-device and all-device. This means that not all players actually need to have a smartphone. Using single-device mode means that all blasters in the battle will sync to that one smartphone via Bluetooth technology. In all-device mode, all players in the battle will need to have a smartphone with the app installed. In other words, it’s either one person using a device, or all players using a device. There’s no middle road. Using all-device mode, each device syncs to an assigned master device, which means that one player is essentially the host of the game. The app is relatively easy to use and tracks the duration of the game and scores of each player. It does add value to the game, but as mentioned, it’s purely optional. 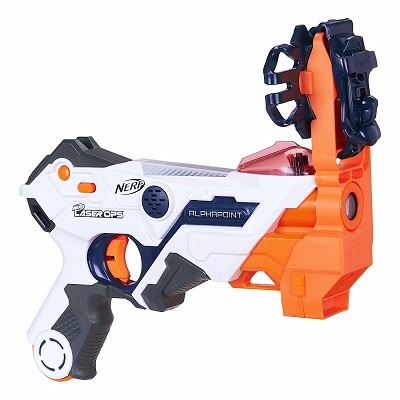 The AlphaPoint blaster is the smaller, semi-automatic pistol of the two blasters available in the Nerf Laser Ops Pro series. Out of the box, it comes with an instructions manual, a rubber armband and a mount attachment to hold your smartphone. The AlphaPoint requires 4 AA alkaline batteries, which are not included. The laser beams come out of the barrel at the front. The laser beams are infra-red which means you can’t actually see them and they are perfectly safe. Located above the barrel is the target receiver which registers hits against you. This also means you don’t have to wear any vests to play laser tag with Nerf Laser Ops Pro. It’s important to point out here that you don’t need to have sniper skills in order to hit that small target. Don’t ask me how it works, but it’s actually quite easy to score points. I’m guessing that the blasters emit very wide laser beams, making it easy to hit the target receiver. Overall, using the blaster is a pretty straightforward affair. Pressing the power button at the back of the blaster activates the device. You then have to select the team you want to be in, purple, red or green. Choosing the purple color essentially means free for all, shoot anyone you like, no teams. Choosing red or green means you can only shoot players with the other color. Firing is simply a matter of pulling the trigger. 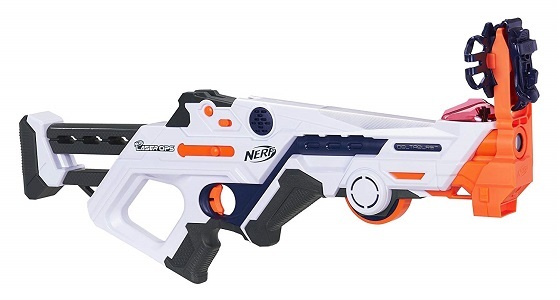 There’s no need to prime or anything, like you’d have to do with conventional Nerf blasters. 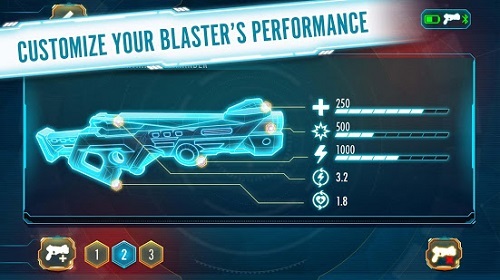 An indicator at the top of the blaster tells you how much ammo you have left in addition to a health status. Running out of ammo is not at all a big drama though. All you need to do is reload via the button at the bottom of the blaster, and you can continue chasing and shooting your enemies. Like with other home laser tag guns, there are lots of sounds you will need to get used to. Each action will have its own sound, which is useful so you know what’s going on. The sounds cannot be turned off or down though, so it really is a matter of getting used to. The sniper rifle style DeltaBurst blaster comes packaged with the blaster itself, instructions manual, a rubber armband and a phone mount that can be attached at the front of the blaster. The DeltaBurst requires 6 AA alkaline batteries, which are not included. The DeltaBurst essentially works the same as the AlphaPoint blaster, it’s just a different type of gun. Because of that, the various buttons are located in different spots. The indicator also works a bit differently, in that it tells you in numbers how much ammo you have left, as opposed to using colors with the AlphaPoint. Both blasters work amazingly well as laser tag guns. 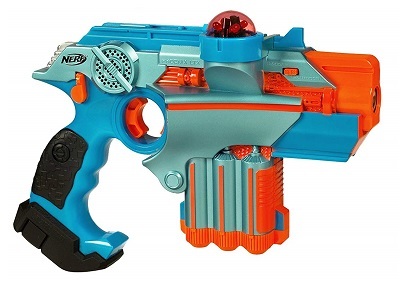 But not just that, Nerf has tried really hard to actually make them look cool. And they’ve succeeded in that. Both the AlpaPoint and DeltaBurst have great looks, which is important. Also worth noting is that both blasters have an advertised firing range of 220 feet or 68 meters. This is pretty impressive, but I don’t think you’d ever need it. I’m loving Nerf Laser Ops Pro. I would say that it’s the best home laser tag set you can get your hands on right now. Both the blasters in the series work really well and don’t have any major flaws that are worth mentioning. As someone who is not at all a fan of the concept of smartphone laser tag, I actually do like the app and how it’s designed to work with the blasters. I still wouldn’t use the app, but that’s only because I’m old school. If you’re like me and you’re not looking for a smartphone laser tag set, go for the Nerf Laser Ops Pro blasters anyway. The app really is 100% optional and the blasters are just as awesome without using Bluetooth and mobile devices. Summary Nerf Laser Ops Pro is Nerf’s latest series of home laser tag blasters with the option to enhance the laser tag battle experience by using smartphones and an app. The blasters themselves have an ergonomic design and are easy to use. While the app definitely adds great features, using smartphones is entirely optional. Overall, the Laser Ops Pro blasters are excellent and reasonably priced home laser tag guns that set the bar high for future products in this demanding industry. I'm a huge fan of Nerf blasters, home laser tag, and other real-life action games that keep us active, social and young at heart.